We are joint creators of all the recipes and delicious baked goods. 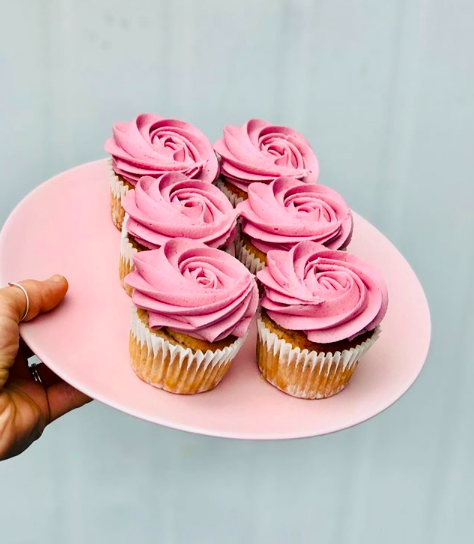 Our roles are expansive from baking and cooking, working markets, festivals and corporate events to marketing, advertising and brand development. Cait loves Instagram and keeps our social media and website super fresh and reflective. Our individuality and strong bond shows through in all aspects of our routine. Although we now live apart we prioritise our time together, whether it's in the cafe or in our spare time on weekends. 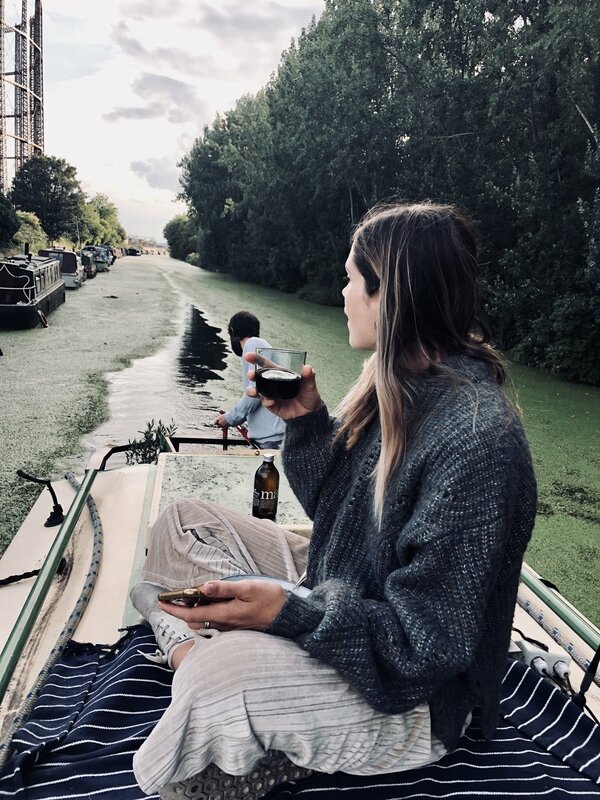 Sophie: “I live on a narrow boat so my day to day routine is different every week. It’s usually dictated on where the boat is moored and where my partner will be working that day. 5 am is the usual wake up time, followed by some yoga and then a chilled drive to the cafe. Cait: “I live my boyfriend near Chalk Farm, we both love to wake up early and journey to work together. I love to catch up on my reading or listen to some chilled tunes. We both get up super early so we can be in the bakery together for some early morning shhhts and giggles before the coffee rush starts. We love being in the cafe, we are always guaranteed good vibes, laughter and lots of love. Over our own coffee we catch up on our evening before, have a little dance and set about planning our diary of cake orders and general day to day baking. We like to get creative and experimental throughout the day. We love that no two days are the same. We are constantly being inspired by the happy people around us along with our various travels. What initially inspired you to launch Cupcakes & Shhht? We realised that we no longer wanted to be confined by an employer. We wanted to be able to run free with our ideas and creativity. We wanted to be our true selves and work in a beautiful, positive environment. What’s the first thing you do every morning? Do you have any specific morning rituals or routines? Sophie: “I wake up at 5am, I do a little dance and sometimes some yoga." Cait: “Me and my boyfriend wake up together and ask Elexa to play the first song that comes into our heads, we then get ready." We are both big believers in keeping a positive mental attitude. We always start the day remembering all the things we are grateful and thankful for. Cait loves to add balsamic and garlic to everything. We are both lovers of a savoury breakkie. 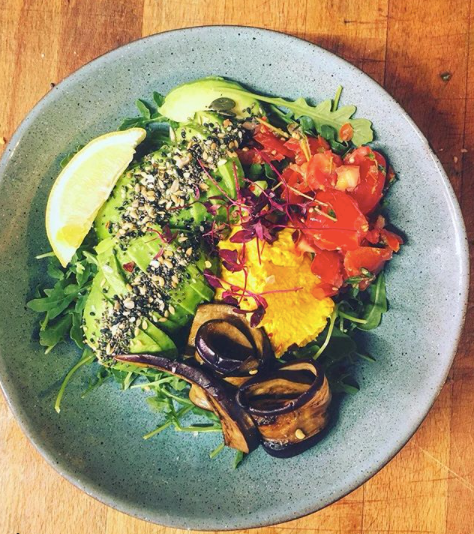 We would usually munch a fresh summer salad, a stuffed warm toastie, savoury croissant or a simple but delicious avo and marmite on toast...Occasionally we will mix it up with a sweet breakfast, cooking up a batch of wholesome porridge or some bircher muesli. What are your five most essential breakfast items and why? Wake up early. Waking up can be hard, so wake up early, remember to be grateful and go get the most out of your day. Oh wow what a dream..
Sophie: “Koh pha-ngan island, me and my partner hired a house on the beach. We woke up everyday surrounded by palm trees (plus the vegan food there is amazing)." Cait: “Byron bay, waking up and running onto the beach to watch the sunrise." Where did you have the best breakfast of your life AKA the one breakfast you wish you could eat over and over again? Sophie:“In Bali at a raw restaurant called Moksha. We had these incredible raw spongy waffles, hollandaise, avocado. coconut bacon. The guy who owns the place is a top dog too! Cait: “My mom makes this amazing cherry jam from the cherries we pick each year from our trees. Cherry jam on top of warm vegan pancakes." How you would spend a lazy morning with no plans at all? Sophie: “My ideal morning would be waking up with a Bonsoy coffee while watching the sunrise. Wandering through columbia flower market before heading for brunch at Dark Arts." Cait: “I love to be by the ocean so my ideal morning would be putting the dogs (that i currently don’t have) in the car and driving to the beach to watch the sunrise. Afterwards going for a surf and grabbing a coffee with some brunch." As founders of a super busy London cafe and bakery,, how do you find balance between work and home life? We used to work 7 days a week doing markets, events, plus all the admin, emails and marketing, which over time does take its toll. But when you are a new business starting out you put your heart and soul into every part of it so we never minded. We worked our asses off for years to get to the position we are in now. We are so grateful to have an awesome team of staff which means we can have weekends off to spend it with family and friends. We are grateful and lucky that work is a pleasure. We never dread coming to work and love that we are always surrounded by our friends and family. We are so fortunate that our work life balance just flows naturally. 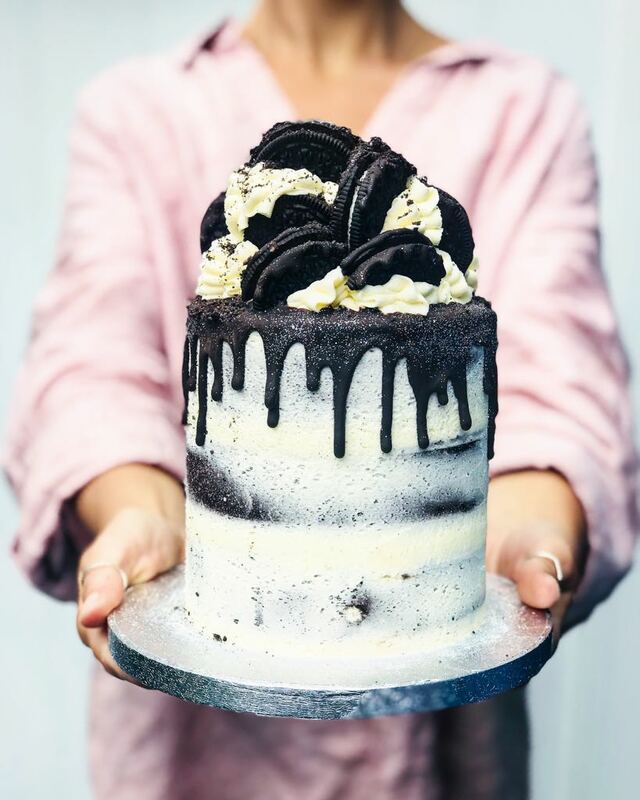 If you had to choose from your entire range, what is the ONE C&S cake or bakery product you couldn’t live without and why? Cait: “The real lemon cheesecake. It is so great to share, especially with people who are not vegan. It blows them away every time." Have you got any simple swaps for the sweet tooths wanting to lead a more plant-based lifestyle? We have been so surprised at how easy it is to bake without all of the traditional ingredients such as dairy and eggs... Anything we have ever missed or wanted, we have just made it ourselves and figured it out. Plus the internet is a huge help, everything is so accessible, from ingredients to ideas and ways to. We are still blown away at how beautiful natural flavours and colours are. Beetroot, turmeric, pea flowers, matcha and charcoal are natural transformers. Did starting your business impact your eating habits and if so, how? Absolutely. You are so aware of what you are putting into your food and the dishes you create, plus what you are putting into your body. Food is our life and we only have one body to live in so you need to look after it. After 6 years working in the sweet industry we have managed really well and found it easy to keep healthy. We are big believers in keeping a balance and love a glass of wine or cocktail. What has been the highlight of launching C&S? Cait: “Seeing the growth and seeing your ideas and dreams become a reality." Sophie: “The first time we made profit (it wasn't even a lot) but we were so happy and proud of ourselves. We took the money home and threw it in the air like a scene from a cheesy movie. We then lost most it in our bedroom." If you could give some advice for anyone considering starting their own business, what would it be? Get a really good accountant. Don’t listen to negativity or people who don’t believe in you. Just start it and follow your dreams. Don’t be scared of failure, everything you do you can learn from. Try not to get down when things don’t go the way you expected. Everything happens exactly as it should, sometimes you just need to trust and believe. Surround yourself with great people. Fancy a slice of the action? Visit Cupcakes & Shhht website for more information.